No-carve Pumpkin decorations were hit at our home until last year. But this year CJ is very particular to carve pumpkins. In fact we have not carved a pumpkin in our life time. As far as possible I'm trying to skip the carving and so whenever we see a pumpkin aisle I try to distract my little one. 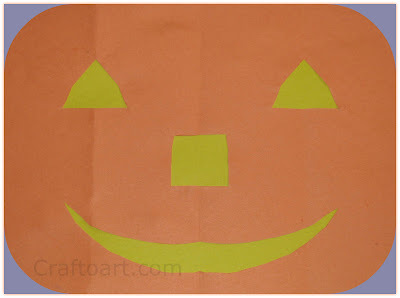 Other day CJ got me an orange construction paper and said "Mommy, you are not buying me a Pumpkin to carve. 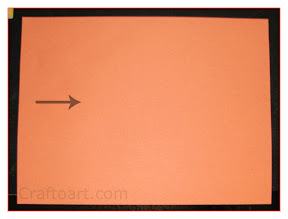 So I'm going to Carve the Paper into a Jack-O-Lantern. Give me the carving material" Oops! Poor little Girl! That's how we made the Paper Jack-O-lantern Craft. This craft involves Folding and cutting with scissors. This is a Halloween Story of BIG Mama, BIG Sarah, BIG Lizzie and Little Nell who live in a great Big house in a great, big woods. All summer long, the family had grown a Big Pumpkin Patch in their Big Garden. During Halloween Big Mama asks Little Nell and her sisters to select their favorite pumpkins to carve. Little Nell selects a Bumpy Little Pumpkin and her sisters are not very happy with her selection. But Little Nell doesn't give up, She carves her pumpkin with the help of Wood animals. Though her sisters think the Jack-o-Lantern is bumpy and Ugly, Big Mama says "Jack-O-lanterns come in all shapes and sizes" and it looks wonderful. It's a cute book with a strong message for kids, any art/craft is different and unique in its own. After folding, draw a Half triangle for the Jack-O-Lantern eyes. Cj was very particular in a triangle because little Nell makes it a triangle. Cut the edges to make round corners like a pumpkin. Unfold and the Jack-O-lantern outline is ready! Yay! We have carved a Jack-O-Lantern! It can also be used as a Jack-O-Lantern Mask with elastic string attached to the ends. 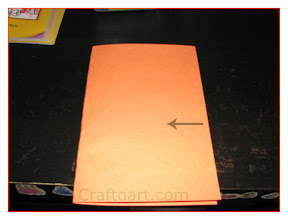 Place the cut out on a yellow construction paper sheet and Glue the wrong side on the sheet. Here you go simple Paper Jack-O-lantern! I love the message of the story! I will have to look for the book. Please think about linking to Read.Explore.Learn. today. Yeah do check the book! The images are beautiful and we love little Nell! Thank you for linking up. I am going to feature your post on the Read.Explore.Learn. Facebook page today. I love it with the yellow paper underneath. nice.. any reason why you don't carve? just curious as its more fun though its a little messy.. take care and welcome back after the break..
No specific reason ani! Oh I just feel sort of lazy to Carve. But this year we are surely going to give it a try. Ooh so cute and great to make it so easy for the children. Lovely.